If you haven’t discovered the rash guard, surf shirt or “fashguard”, it’s time to check one out. I was first introduced to them many years ago when the cool (ok, let’s be real here and refer to them as smoking hot) Hawaiian paddler dudes teaching stand up paddle were wearing them. Fast forward several years and rash guards are now everywhere. I love them because they’re ultimate lazy beach mom attire. Who has time to put sunscreen on? It’s hard enough to get it on the kids, get into your own suit, and get out the door. With SPF 50+ you don’t have to worry about overexposure or reapplying. Have you ever had your toddler pull your suit off accidentally? No worrying about another type of overexposure when you step out of the water. 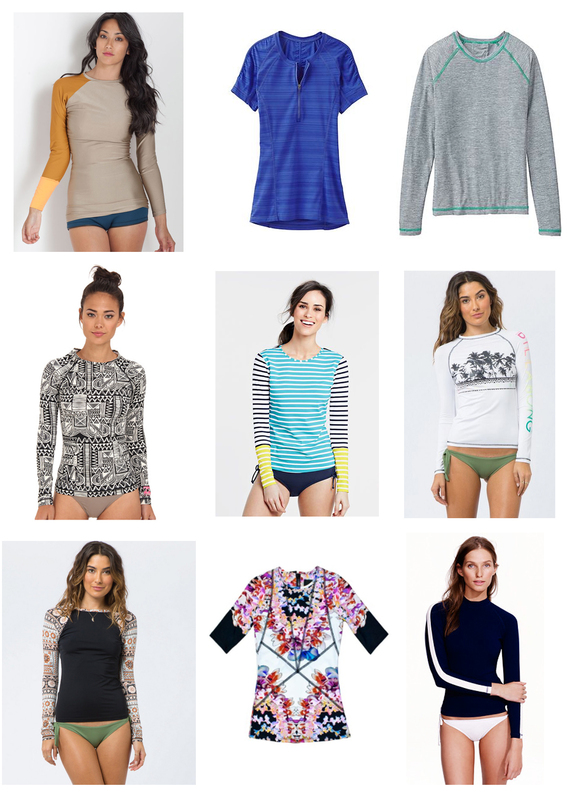 Now that covering up is fashionable are so many cute rash guards to choose from it’s a little overwhelming. Choose your sleeve length — I’m all for the long sleeves but if torso modesty or an inability to put sunscreen on your own back is all you care about then look for shortsleeve or sleeveless. Consider the weight — unless you need this for cool climates (hello NorCal) you want something really lightweight so you’re not overheated when you’re out of the water. How often will you wear this thing? If you’ve only got one trip to the beach on the horizon, look for a style that can double as a workout top or long underwear. Athleta and Patagonia are great choices if you want a cross-functional design. Seea: I love their whole collection — so many sophisticated colors and interesting print combinations. Matching swim suits too! Athleta: Short sleeve version of what I’m wearing above. The half zip is such a nice feature. Athleta: Love the gray t-shirt look – would work over just about anything. Lands End: Preppy stripe mix – they have cute polka dots too. Cynthia Rowley: My fantasy pick. Her surf collection is so gorgeous. Billabong: Indian inspired print sleeves and earthy colors. J.Crew: The high neck on their styles are surprisingly flattering in a Bond Girl kind of way. A rear zipper helps you get them on. The selection at Athleta, Swim Outlet, J.Crew, and Nordstrom were all great. And given that it’s almost fall (at least in the fashion world) many are currently on sale. Still need inspiration? Check out this post on Honestly WTF.